The story in my upcoming book Mercurium has really gone under the skin on me. Adel Lady Metta Fock born Ridder Bjelke accused in 1802 of the poison on two of the family's four children and her husband. But Metta is strengthened and defended themselves with flying colors during the trials that follow, perhaps she is even too good in the end you just want to force from her a confession. To speed up this excuse to her every opportunity to defend himself. She may not meet anyone, do not use paper and pencil, and therefore can not write any appeal. I do not want to tell the whole story here but it's been an uphill struggle to write this time. Why it felt so amazing when my good friend and genealogist Bridget found living relatives of Metta. Less than I thought it was true. For a long time I sat with the phone number of a certain Cecilia before I finally rang. Metta is the fact Cecilia's grandmother's grandmother's grandmother, which she did not know. Last Friday I was in Stockholm and finally got a face on Cecilia and together we got to see Mettas clemency currently on the Nordic Museum. Some days will probably always remember and this was definitely one of them. 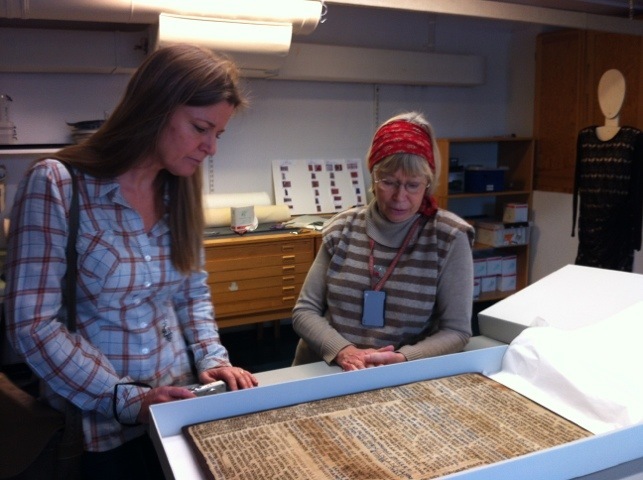 Thanks to Berit Eldvik objects curator at the Nordic Museum, who showed us clemency and stands next to Cecilia in the picture.